Located about 25 miles northwest of Orlando, Sorrento and the neighboring community of Mt. Plymouth is a rural area in Lake County dotted with horse farms and cattle ranches is between Sanford and Mt. Dora. These two communities are contiguous and each has a small business district located on State Road 46.. Buyers are attracted to the area's rolling hills and its laid-back lifestyle, as well as the typically larger parcels of land. Most homes will be on a minimum of one acre with many on parcels of five acres or more. As part of the Wekiva River basin, the area is also home to many species of wildlife, including a large black bear population. The proposed Wekiva Parkway, which would complete the beltway loop around Orlando, will likely open the area up to more intense and higher density real estate development. 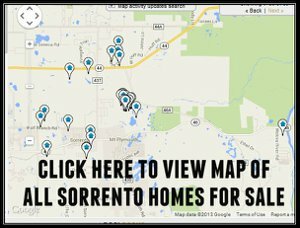 Click on the blue button to view all Sorrento homes for sale. Beautiful property with great layout. The backyard is very big and no neighbors.